In Power BI Desktop and the Power BI service, you can use R-powered custom visuals without any knowledge of R and without any R scripting. This enables you to harness the analytic and visual power of R visuals, and R scripts, without learning R or doing any programming yourself. 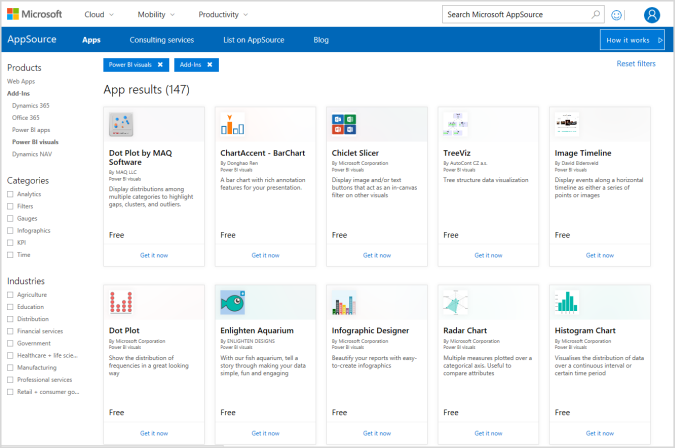 To use R-powered custom visuals, you first select and download the R custom visual you're interested in using from the AppSource gallery of custom visuals for Power BI. The following sections describe how to select, load, and use R-powered visuals in Power BI Desktop. To use R-powered custom visuals, download each visual from the custom visuals library, then use the visual like any other type of visual in Power BI Desktop. 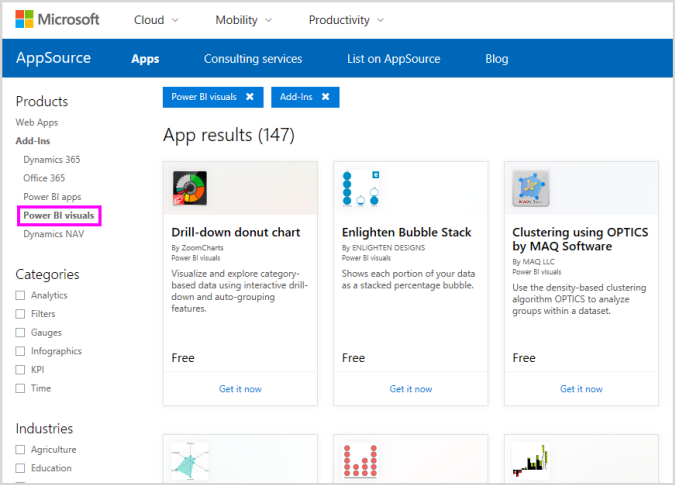 There are two ways to get custom visuals: you can download them from the online AppSource site, or browse and get them from within Power BI Desktop. 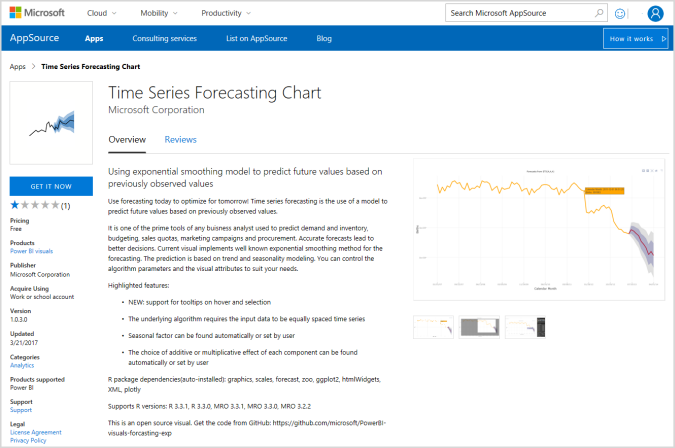 Navigate to the Power BI visuals library, found at https://appsource.microsoft.com. 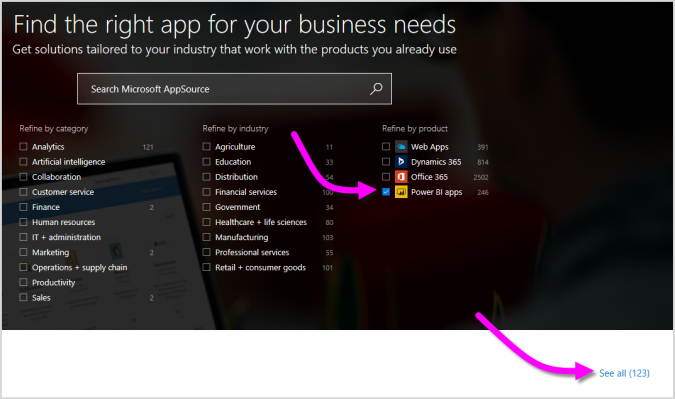 Select the Power BI apps checkbox under Refine by product, then select the See all link. 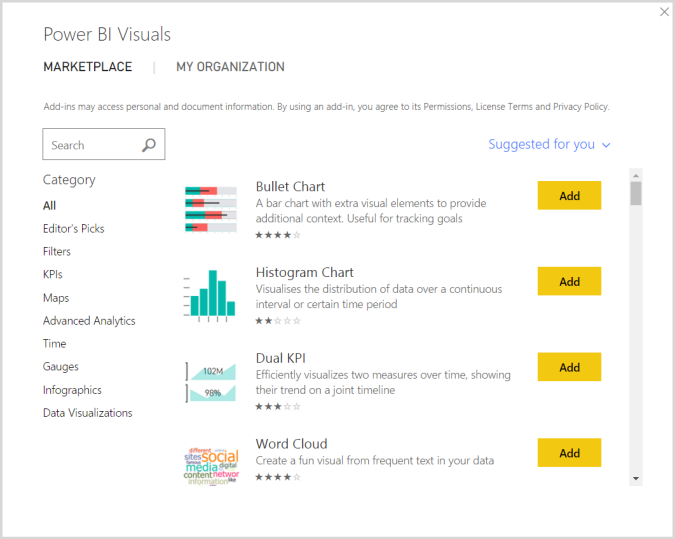 On the Power BI visuals library page, select Power BI visuals from the list of Add-ins in the left pane. Select the visual you're interested in using from the gallery, and you're taken to a page that describes the visual. Select the Get it now button to download. 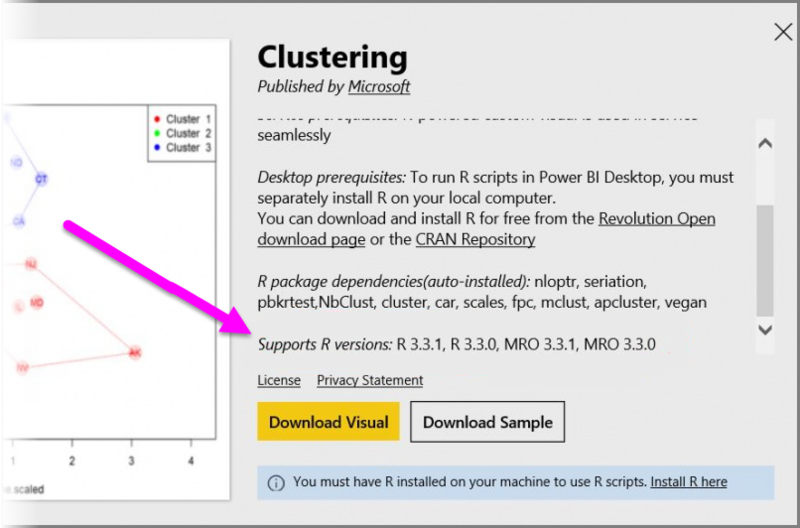 For authoring in Power BI Desktop, you need to have R installed on your local machine. But, when users want to view an R-powered visual in the Power BI service they do not need R installed locally. Once the visual is downloaded (which is like downloading any file from your browser), go to Power BI Desktop and click the ellipsis (...) in the Visualizations pane, and select Import from file. Navigate to where the visual file was saved, then select the file. Power BI Desktop custom visualizations have the .pbiviz extension. 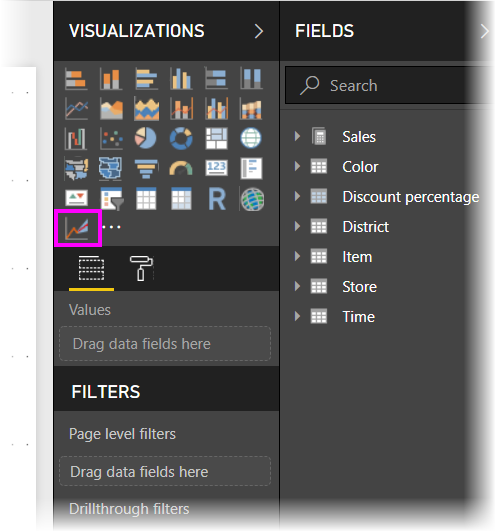 When you return to Power BI Desktop, you can see the new visual type in the Visualizations pane. 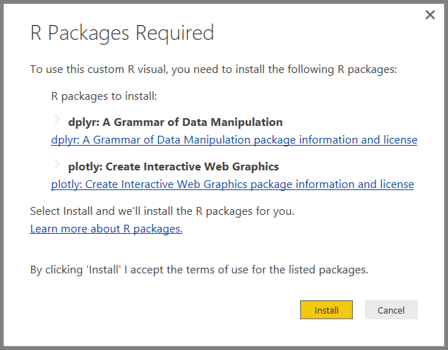 When you import the new visual (or open a report that contains an R-powered custom visual), Power BI Desktop installs the required R packages. From there, you can add data to the visual just as you would any other Power BI Desktop visual. When complete, you can see your finished visual on the canvas. 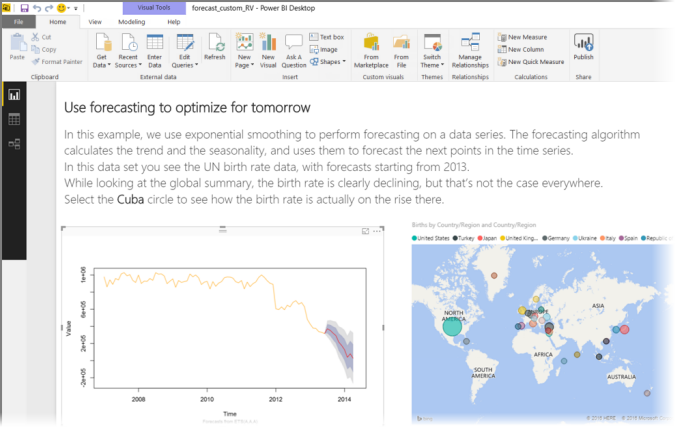 In the following visual, the Forecasting R-powered visual was used with United Nations (UN) birth rate projections (the visual on the left). Like any other Power BI Desktop visual, you can publish this report with its R-powered visuals to the Power BI service and share it with others. Check the library often, since new visuals are being added all the time. You can also get custom visuals from within Power BI Desktop. 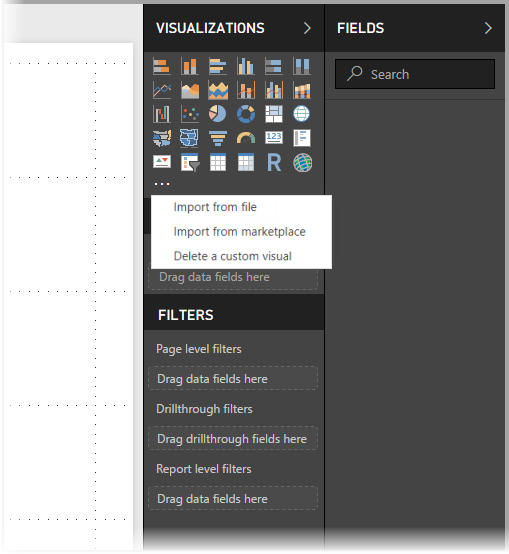 In Power BI Desktop click the ellipsis (the ...) in the Visualizations pane, and select Import from marketplace. When you do so, the Power BI Visuals dialog appears, where you can scroll through the available custom visuals and select what you would like. You can search by name, select a category, or just scroll through the available visuals. When you're ready, just select Add to add the custom visual to Power BI Desktop. The following section describes troubleshooting steps you can take to help address trouble you might run into. Remove the custom visual, then install it again. This initiates a reinstallation of the R packages. If your installation of R is not current, upgrade your R installation, then remove and reinstall the custom visual as described in the previous step. Supported R versions are listed in the description of each R-powered custom visual, as shown in the following image. You can keep the original R installation and only associate Power BI Desktop with the current version you install. Go to File > Options and settings > Options > R scripting. a. Download the R-powered visual installation script and save that file to a local drive. a. Use R Studio and follow the step outlined in 3.b. above (run the script line from the R console). b. If the previous step doesn't work, change Tools > Global Options > Packages in R Studio, and enable the checkbox for Use Internet Explorer library/proxy for HTTP, then repeat step 3.b. from the above steps.